Europa Report is a 2013 science fiction film directed by Sebastián Cordero, starring Christian Camargo, Anamaria Marinca, Michael Nyqvist, Daniel Wu, Karolina Wydra and Sharlto Copley. A found footage film, it recounts the fictional story of the first crewed mission to Europa, one of the four Galilean moons of Jupiter. Despite a disastrous technical failure that causes the loss of all communications with Earth mission control and a series of crises, the crew continues its mission to Europa and finds mounting evidence of life on the moon. Dr. Unger (Embeth Davidtz), CEO of Europa Ventures, narrates the story of the Europa One mission. Six astronauts embark on a privately funded mission to Jupiter's moon Europa to find potential sources of life. The crew members are Captain William Xu (Daniel Wu), pilot Rosa Dasque (Anamaria Marinca), chief science officer Daniel Luxembourg (Christian Camargo), marine biology science officer Katya Petrovna (Karolina Wydra), junior engineer James Corrigan (Sharlto Copley) and chief engineer Andrei Blok (Michael Nyqvist). After six months of mission time, a solar storm hits the ship, knocking out communication with mission control. Blok and Corrigan perform an EVA to repair the system from outside but an accident rips Blok's suit. While he is being guided back into the airlock, Blok notices that Corrigan's suit has been coated with hydrazine and he cannot enter the airlock or else he would contaminate the rest of the ship. Blok attempts to save Corrigan by taking him out of his suit, but he blacks out from a lack of oxygen. Knowing there is no hope for himself, Corrigan pushes Blok into the airlock, thus propelling himself away from the ship as it continues its journey to Europa. Stranded, he dies in space; the crew continue with the mission, demoralized by Corrigan's death. After twenty months, the ship lands safely on Europa but misses its target zone. The crew drills through the ice and releases a probe into the underlying sea. Blok, who is sleep-deprived and eliciting concern in the rest of the crew, sees a light outside the ship but he is unable to record it or otherwise convince the crew of its occurrence. The probe is struck by an unknown lighted object and contact with it is lost. Petrovna insists on collecting samples on Europa's surface; the crew votes and she is allowed to go. Analyzing the samples, Luxembourg discovers traces of a single-celled organism. Petrovna sees a blue light in the distance and decides to investigate it. As she approaches the light the ice below her breaks and she falls through. Her head-mounted camera continues to broadcast, displaying her terrified face as the blue bioluminescence is reflected in her eyes, before cutting out. The crew agrees to leave to report their discovery to Earth but the engines malfunction. As the ship hurtles back to Europa's surface, Xu unbuckles from his seat to dump water shielding to reduce the impact speed. Remarkably, the ship crashes at the originally-targeted landing site. On impact, Xu is killed and the ship is damaged, leaking oxygen and losing heat. It begins to sink into the ice. Blok and Luxembourg suit up to make repairs outside the ship. Luxembourg tries to descend but falls through the ice. Blok knows that there is no chance that he alone will be able to repair the ship before it sinks. Instead, he manages to fix the communication system, at the expense of turning off the life support systems, just before the same blue light Petrovna saw approaches and he appears to fall through the ice as well. Dasque re-establishes communication with Earth. All the collected images and data that have been saved since the solar storm are sent, just as the ice cracks and the ship begins to sink. Alone and anticipating her death, Dasque opens the airlock to flood the ship in hopes of revealing the source of the light. As the water rises to the cockpit, she sees a tentacled, bioluminescent creature rising toward her, before the camera cuts out. In the epilogue, Unger confirms that the crew of Europa had discovered life and exceeded every expectation, as the footage plays from an earlier scene of the crew posing in front of the camera. Filming took place in Brooklyn, New York. The first image from the film was revealed on February 11, 2012. A viral website to promote the film was launched shortly afterward. The screenplay was written by Philip Gelatt and the production design was done by Eugenio Caballero. It was scored by Bear McCreary. The movie is a found footage film and follows a nonlinear progression. The crew used as inspiration real footage from the International Space Station and space walks from the space shuttle. The space ship was designed through computer graphics, giving high detail to the camera angles to be used in the film. Weightlessness was simulated with balance balls, suspension from wires was used for interior shots. The flooding ship was filmed on a one-third scale model. The aspect of the moon Europa was based for accuracy on data from NASA and Jet Propulsion Laboratory (JPL) maps of the moon's surface. The creature's design included bio-luminescence from the initial concepts. The visual effects supervisor stated that the creature was based on a cross of an octopus and a squid, with early sketches resembling a jellyfish and a manta ray. An online trailer was released on May 20, 2012. The film was released on Video on Demand, iTunes, and Google Play Movies & TV on June 27, 2013, and was released theatrically on August 2, 2013. 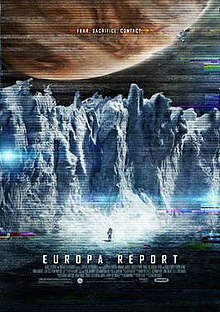 Europa Report has received generally positive reviews from critics. Rotten Tomatoes gives the film an 80% "Certified Fresh" rating based on 74 reviews, its summary reading, "Claustrophobic and stylish, Europa Report is a slow-burning thriller that puts the science back into science fiction." Review aggregation website Metacritic gives a rating of 68 out of 100 based on reviews from 25 critics, which indicates "generally favorable" reviews. Justin Chang, of Variety magazine, called the film "A reasonably plausible and impressively controlled achievement." while space.com said the film was "One of the most thrilling and realistic depictions of space exploration since Moon or 2001: A Space Odyssey." Fearnet said the film was "One of the most sincere, suspenseful and fascinating science fiction films of the past few years." The film was nominated for the Bradbury Award by the members of SFWA. 2010: Odyssey Two, the 1982 novel and second in a series of four by Arthur C. Clarke features a strikingly similar plot-line omitted in 2010: The Year We Make Contact, Peter Hyams' 1984 sci-fi film adaptation and sequel to 2001: A Space Odyssey. In the 2010 movie, a Russian unmanned probe mysteriously disappears near the surface of Europa, yet in contrast, the novel details a premise featuring a space race to Jupiter with the joint Soviet-American mission following a faster Chinese ship, the Tsien that must land on Europa to refuel with water from the icy moon. The Tsien is ambushed and destroyed by an indigenous Europan life-form attracted to lights stranding the only survivor, Professor Chang who radios the story to the Leonov spacecraft. Conversely, the novel's Leonov does not have the "luxury" of gravity, yet Syd Mead's Leonov spacecraft design in the movie features centrifugal force artificial gravity similar to the Europa One mission in Europa Report and other science fiction. ^ Turan, Kenneth (August 1, 2013). "Review: 'Europa Report' gets good mileage from low-budget sci-fi". Los Angeles Times. Tribune Company. Retrieved December 21, 2013. ^ "Europa Report". Box Office Mojo. Retrieved October 6, 2013. ^ "Europa Report – Movie Trailers". Apple Inc. Retrieved August 9, 2013. ^ a b c "First look at Sharlto Copley in sci-fi film The Europa Report". Commingsoon.net. February 11, 2012. Retrieved August 9, 2013. ^ a b c "The Making of Europa Report". fxguide.com. Retrieved 22 October 2013. ^ "The Europa Report goes viral". February 13, 2012. Retrieved February 15, 2012. ^ "Bear McCreary Scoring 'The Europa Report'". Film Music Reporter. Retrieved 1 December 2012. ^ a b "Europa Report Teaser Online". Empire Online. Archived from the original on 25 July 2013. Retrieved 21 May 2013. ^ "Europa Report – Rotten Tomatoes". Retrieved 3 August 2013. ^ "Europa Report Reviews". Metacritic. CBS. Retrieved August 9, 2013. ^ Chang, Justin. Variety, film Review, Europa Report, June 21, 2013. Accessed: August 9, 2013. ^ First Trailer for Europa Report unveiled, "Space.com", May 21, 2013. ^ 2013 Nebula Nominees Announced, SFWA, 02-25-2014. This page was last edited on 6 March 2019, at 11:57 (UTC).